Apperson Hall has received extensive exterior rehabilitation during 1999, coinciding with its Centennial year. Did you know that Apperson is the fourth-oldest building on the OSU campus? The others are Benton Hall (1889), Benton Annex / Women’s Center (1892), and Fairbanks Hall (1892). Time and weather have taken their toll on Apperson so OSU’s Facilities Services awarded a contract to McKenzie Commercial Contractors of Eugene for exterior rehabilitation, which included rebuilding the parapet wall, replacing roof drain systems, repair of masonry, complete weatherproofing, and painting. 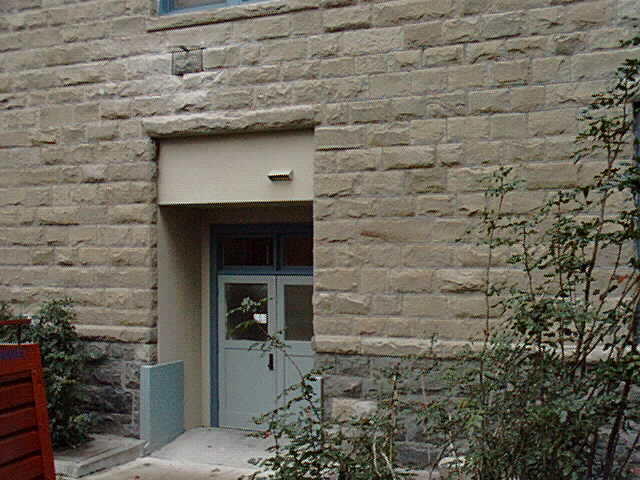 A striking feature of Apperson Hall is its facing of stone, with an elaborately carved doorway. The base courses of stone, up to the first-floor windows, are granite, and the upper courses are all sandstone. The sandstone is much easier to carve but is subject to weathering, while the granite is “eternal.” It was the poor condition of some of the sandstone blocks, along with some third-floor leakage problems, which prompted the exterior rehab project. 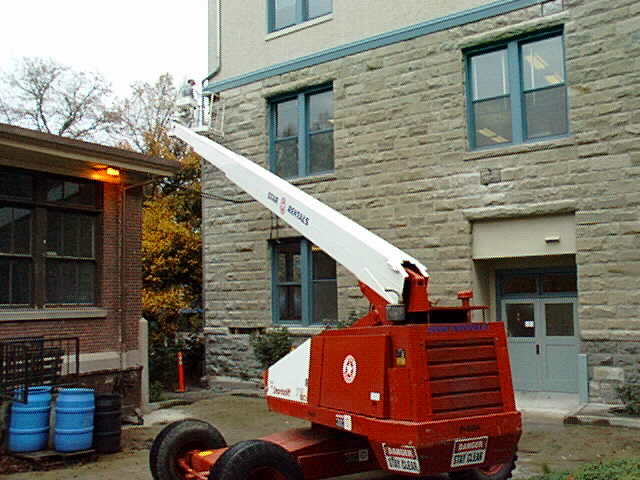 Pioneer Waterproofing of Portland was the masonry subcontractor on the job; they are one of only three contractors in Oregon who are approved to do work on historical masonry structures. Pioneer has also worked on Crater Lake Lodge and Crown Point Visitor Center among many others. Two of their masons, Kirk Clark and Lindsay Moore kindly provided some insight into the details, and some other facts were extracted from articles by Kenneth Munford that appeared in the Corvallis Gazette-Times on December 2 and 9, 1985. Left: Drilling through the mortar to wiggle out the old granite block, a slow process. Right: New granite pieces replace those that were cracked and chipped. Each block is about 14 inches deep. Lindsay Moore of Pioneer Waterproofing says the holes revealed timber support beams that are in excellent condition. The stone face of Apperson Hall is substantial; most of the blocks are 10 to 13 inches thick. A narrow cavity partially filled with rubble separates the stone from the wooden structure of the building. Of the dozen or so sandstone blocks that needed replacement, many were fully split or so badly crumbled as to pose a risk to persons walking by. The granite used in the base courses was quarried in Polk County and the sandstone came from a Coast Range quarry either near Wren or Eddyville. These quarries have long since ceased to exist, and because Pioneer was required to match stone color and texture, they turned to a supplier whose database selected a source in Ontario, Canada! The order for the needed blocks arrived, then each had to be hand fitted, and some even needed a bevel cut along one edge to match. Mr. Moore set up his trimming site at the southwest corner of the building and for a couple weeks generated lots of dust and chips as he custom fit each block. Work was finished about the third week in December 1999, in spite of some really foul weather!